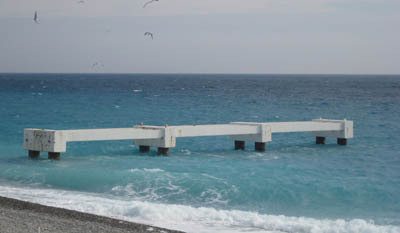 If you have been to Nice, France then you must have asked: "what was the origin of this pier ..."
In 1891 the construction of du casino de la Jetée-Promenade began... it remained until the end of WWII when the Germans began to dismantle the structure stripping it of it's valuable metals. "...In 1942, in spite of a deferment and some attempts at " soirées", the pier closes on December 20, 1942 definitively. 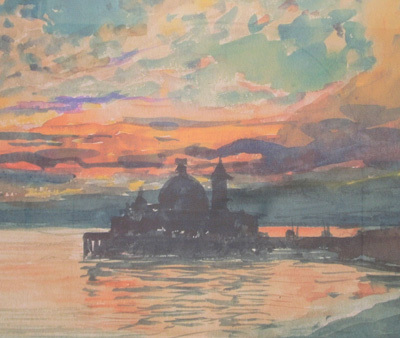 The Pier was stripped of its coppers, its bronzes, its brasses, and its wiring electric and any objects, despite protests of the President of the Council d' Administration, Jacques Fastout. After the departure of the Italians. The Germans in January 1944 decided to demolish the Pier to recover the metal which constituted it. On November 20, 1946, l' Chief engineer of the Highways Departments, by decree prétectoral: " withdraw with the New Pier Walk of Nice l' authorization d' occupation of the Maritime Public domain granted on March 31, 1879… the Company will have to give the places in their states primitifs". The Company calls some with the Council d' State, but in but 1947, it must be solved to make disappear the vestiges. On July 13, 1951, the Council d' State declares valid the decision of withdrawal of November 20, 1946, the Palate of the Pier Walk definitively died.